ProTech is one of America’s outstanding knife manufacturers, and their new Tactical Response 5 (TR-5) assisted-opening knife is just another example of their fine craftsmanship. The TR-5 has several features desirable for officers in a variety of assignments, and is the first spring-assisted ProTech knife. ProTech has already produced four successful Tactical Response knife lines, with the TR-5 Tactical Response knife being the latest version. Each Tactical Response series has built upon the design and materials of the previous line. The TR-5 captures the best of the TR-4 series knives, while adding the assisted-opening action as well. The new ProTech TR-5 assisted opening knife, with stonewash blade. The latest Tactical Response knives by ProTech are the very first spring assisted knives for the well-respected knife manufacturer. 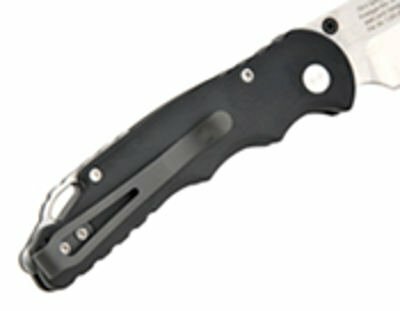 ProTech claims the TR-5’s spring assisted action has the same power and speed of comparable auto-opening knives. This is some claim, as spring assisted knives can sometimes be finicky when opening. The newly designed TR-5 Titanium Assist mechanism comes from the creative mind of veteran and award-winning knife designer Matthew Lerch. Having the precision skills of a former watch and jewelry designer, Lerch’s Titanium Assist action features a smooth but robust assisted-opening. The Titanium Assist mechanism is activated when the user begins to push the blade mounted thumb stud forward. There is a slight increase in resistance, common to assisted-opening blades, before the mechanism takes over and completes the blade opening on its own. This feature acts somewhat like a safety, ensuring the blade only opens when enough pressure is applied. Simply push forward on the thumb stud – once the bias towards the closed position is overcome, the superior coil spring action of the TR-5 takes it the rest of the way open. To close the knife – push the button to unlock and fold closed. Resistance will be felt as the blade gets close to folding it back into the frame. This is completely normal. Push past the resistance to place the blade at rest back in the handle. The strong resistance while closing is necessary due to our strong spring action! Closing the locked open blade simply requires the user to press the release button on the forward side of the handle. Once depressed the blade is ready to fold back into its closed and secure position. Users should expect some resistance just before the blade completes is closing motion, as this is to overcome the strong spring-action. The TR-5 has two, subtle finger grooves at the front of the handle to assist with greater grip retention. 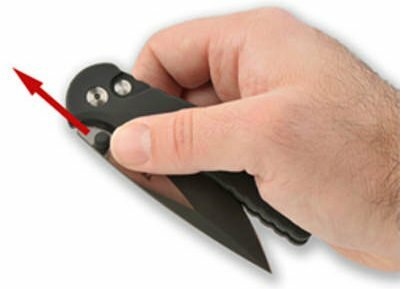 The convenient pocket-clip carry bar is mounted on the right side of the grip for a blade down carry method. There is a lanyard slot towards the rear of the handle, allowing for a neck carry if desired. Finally, there is a subdued glass-break on the pommel of the knife. This glass-break is rounded to avoid inadvertent pokes or scratches, but made of 416 stainless steel to ensure success. The lanyard slot and glass-break feature can be seen on the back of the TR-5. The TR-5 has a slightly smaller overall size than the previous TR-4, providing the user easier handling without compromising potential uses. The smaller profile makes the TR-5 a much greater candidate for an everyday carry (EDC) knife. Made from quality materials the TR-5 is in the line of “lifetime” products that law enforcement officers and civilians come to depend upon. Though more expensive than other quality knives, the craftsmanship and durability could outweigh the original cost. The TR-5 with DLC black blade is an attractive option. Law enforcement officers, and civilians alike, should consider the overall purpose of the knife when purchasing a knife as a tool. If all you need is something to cut open boxes, than you can find dozens of “throw-away” knives for much cheaper. However, if your knife selection may need to cut a seatbelt to save a crash victim, cut through clothing to expose traumatic injuries, of even be a last-resort self-defense weapon, than the quality of materials and craftsmanship take on much more merit. ProTech knives are the later, from our experience, and worthy of consideration despite a price tag higher than several competitors. The BlueSheepDog Crew takes our posts and recommendations seriously. We do not want to endorse a product for officers in the field, that could fail them at the critical moment. Therefore, we can only attest to the quality manufacturing and selection of materials for the ProTech TR-5, as we have not been able to test this knife sufficiently to endorse its use by police officers. However, the BSD Crew has handled ProTech knives frequently, and they are one of our “must stop” destinations at SHOT Show. In our limited exposure to ProTech products under these circumstances we have been impressed with the craftsmanship, fit, handling characteristics, and materials. With that in mind, we believe the ProTech TR-5 could make a great EDC knife on-duty or off-duty.